For Almost 30 Years: On Saturday, October 13, 2007 we celebrated the preserve's 20th anniversary at the McAlhany property with a BBQ and remarks to rededicate our commitment. We were proud to host local friends and a few relations of Marvin McAlhany for whom the preserve is named. 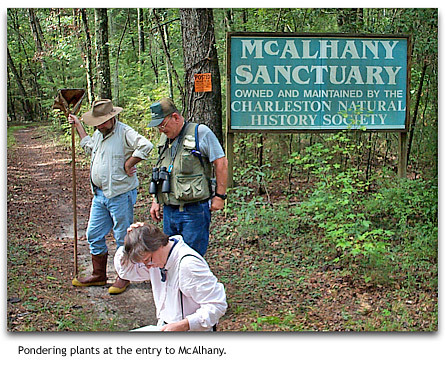 The Charleston chapter manages the McAlhany Nature Preserve. 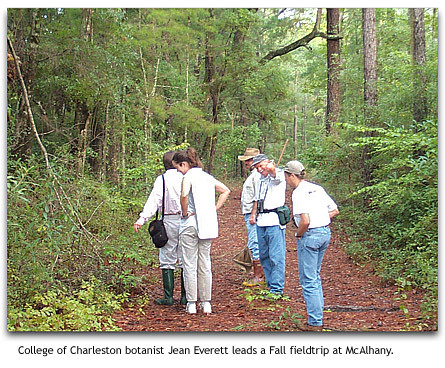 This beautiful 367 acre property on the Edisto River near St. George, SC was donated to the Charleston Natural History Society (CNHS) in 1986, and it was dedicated as a nature preserve in honor of Marvin McAlhany on January 18, 1987. In order to ensure that McAlhany remains undeveloped, CNHS entered a conservation easement agreement with the Lowcountry Open Land Trust on December 19, 2001. Over the past several years the chapter has renewed its commitment to the management of the preserve. 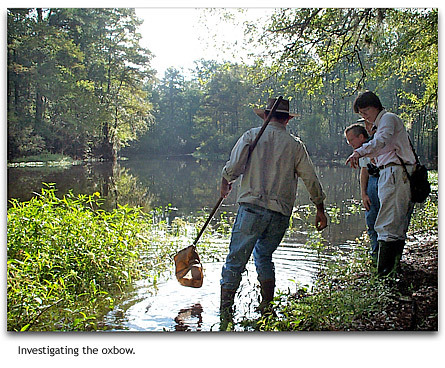 For a relatively small piece of land it includes an incredibly diverse array of habitats, beginning with 1.5 miles of frontage on the Edisto River and a nine-acre oxbow lake. Some other notable features include: a mixed Mesophytic hardwood bluff (great for spring wildflowers); a beech, magnolia and spruce pine hammock – a possibly unique plant association; upland oak-hickory forest; bottomland hardwoods forest (including many acres along Cattle Creek); freshwater marsh; a low water limestone outcrop; and of course the cabin and picnic area near the lake. There is a major long-term longleaf pine and native grass restoration project in progress in old field area across Wire Road, and members have begun to make improvements to the trail system (and hope to add new trails in the future). The chapter hosts occasional barbeques as well as nature walks and working fieldtrips to the property.